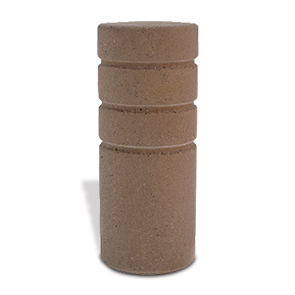 Contribute to the safety and security of the community with a solid concrete bollard. The minimalistic three ring reveal design blends well with many modern landscape design approaches. Strategically place this round concrete bollard to designate pedestrian lanes, protect sidewalk cafe seating or restrict vehicle access to unauthorized areas. The heavy weight reinforced concrete construction ensures maximum stability, durability and longevity. Standard and premium finishes available to perfectly accent any aesthetic.